Brown-headed Cowbird at the top of the dawn redwood in our front yard. Gray Catbird at the edge of the red maple swamp out back. Eastern Phoebe holds still for a moment. Red-winged Blackbird sings atop a maple at the edge of the swamp. Eastern Towhee, female, scuffling in leaves at the edge of the field. This entry was posted in Uncategorized and tagged backyard birds, birds, Brown-headed Cowbird, Common Yellowthroat, Eastern Phoebe, Eastern Towhee, Gray Catbird, Red-winged Blackbird, Tree Swallows on May 20, 2016 by Amy. 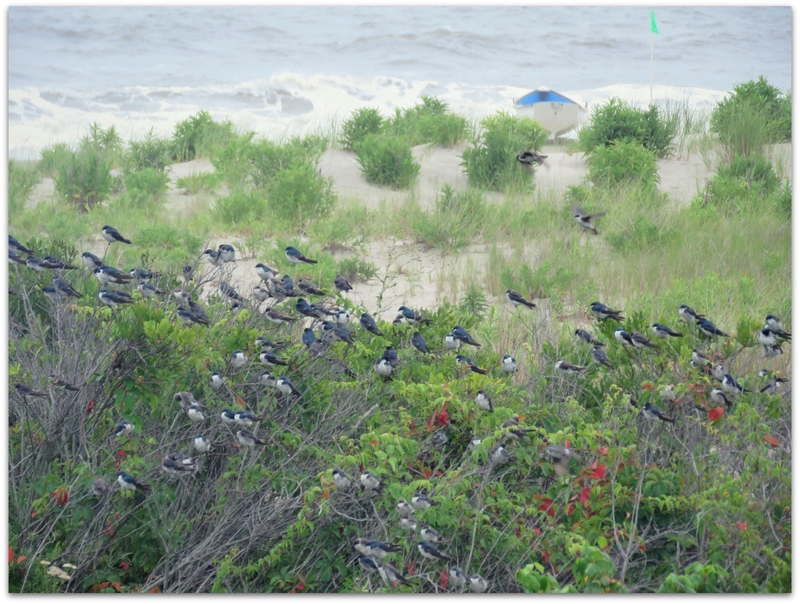 Tree swallows perched on bayberry bushes in the dunes, Ocean City, N.J.
Big flocks… presumably migrating. It was a pleasure to watch them swoop and soar and catch bugs on the wing (from the porch of our vacation rental), then sometimes all flutter down to rest in the bushes. And maybe eat bayberries? I wonder if the pair of tree swallows that nests each summer in our backyard migrates along this route too. Long-distance migrant. 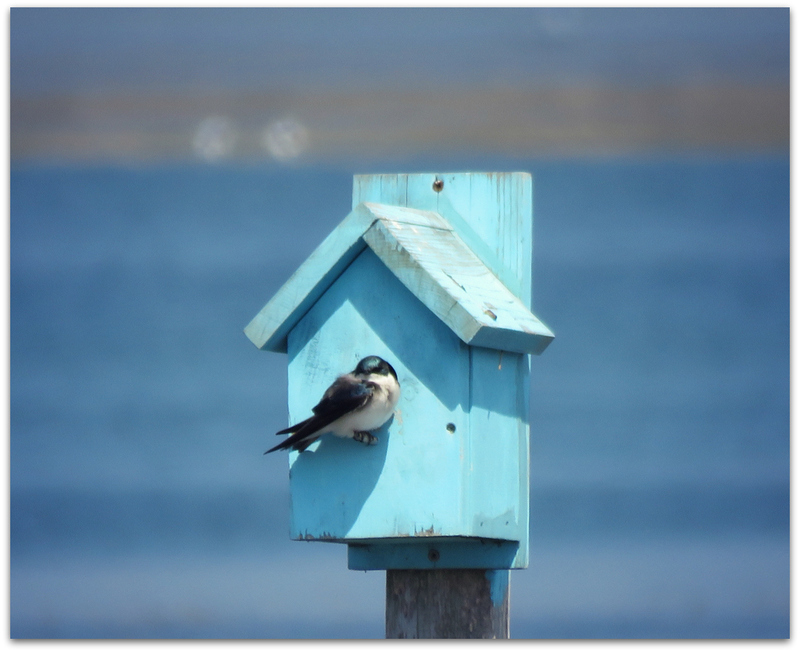 Tree Swallows begin migrating south in July and August, flying during the day and roosting in large flocks at night. 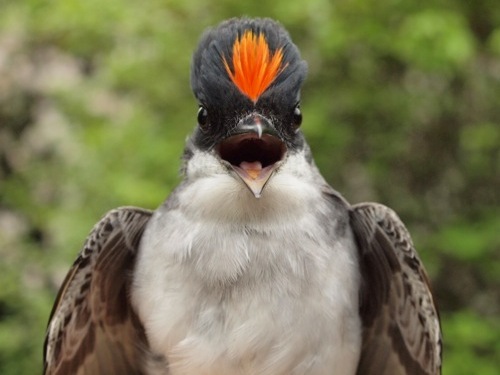 Eastern populations probably migrate along the Atlantic coast to winter in Florida and Central America. 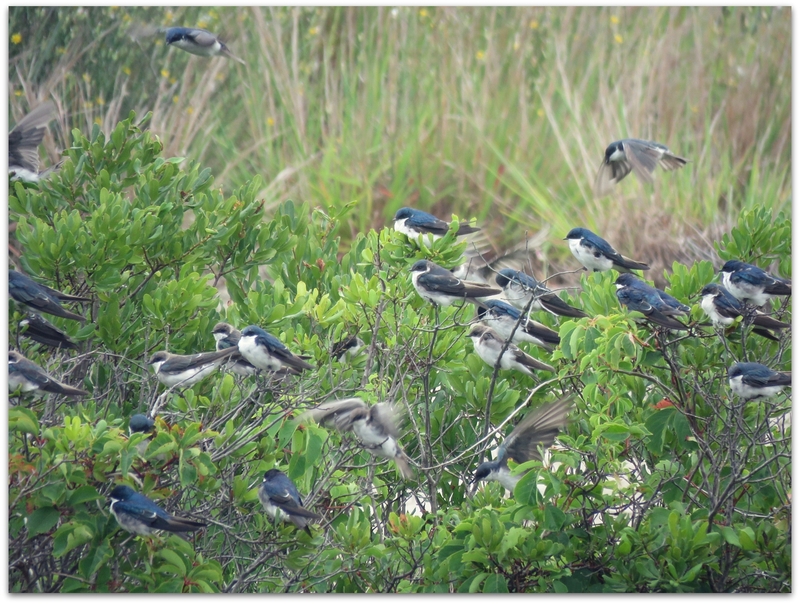 So, since they prefer both flying insects and seasonally abundant plant foods it’s no wonder that after nesting Tree Swallows flock up to search for food. 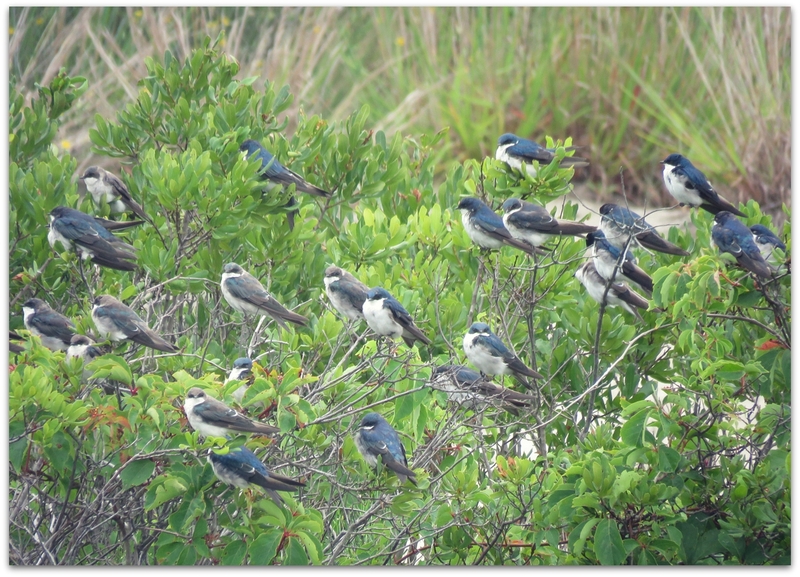 Tree Swallows are especially fond fruits of waxmyrtle and bayberry bushes that grow in sandy soils near seacoasts. They are one of the very few birds able to digest the energy-rich waxy outer coatings of these berries. 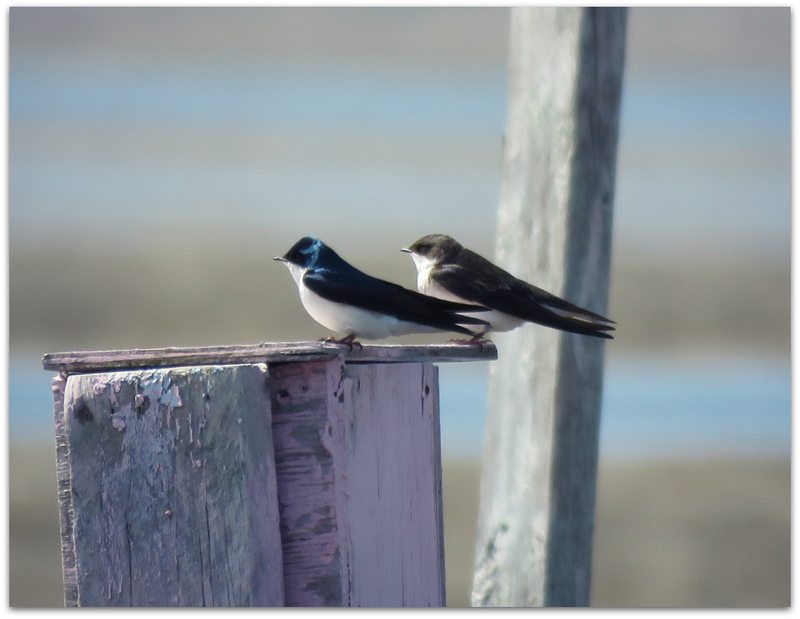 This entry was posted in Uncategorized and tagged birds, Tree Swallows on August 10, 2015 by Amy. 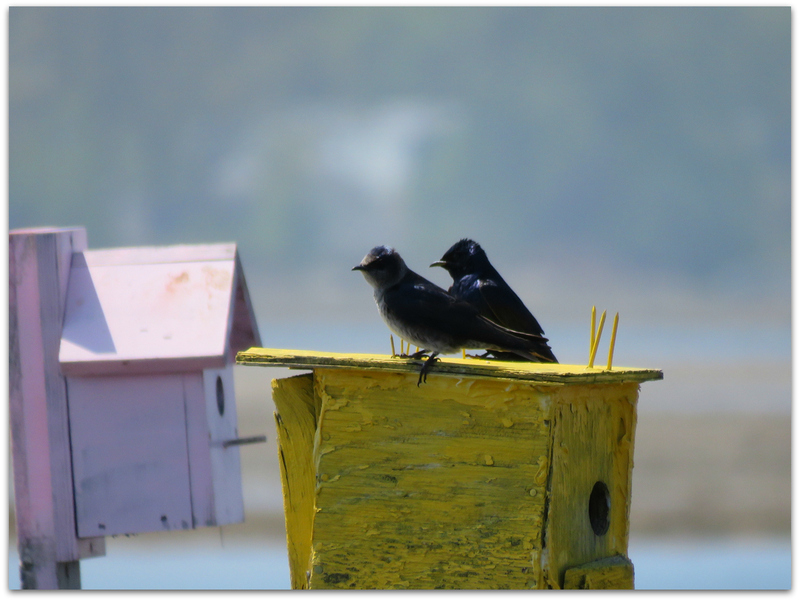 Charming domestic scene from last Saturday morning: a pair of Tree Swallows and a plastic purple martin on the purple martin house in our back field past the pond. 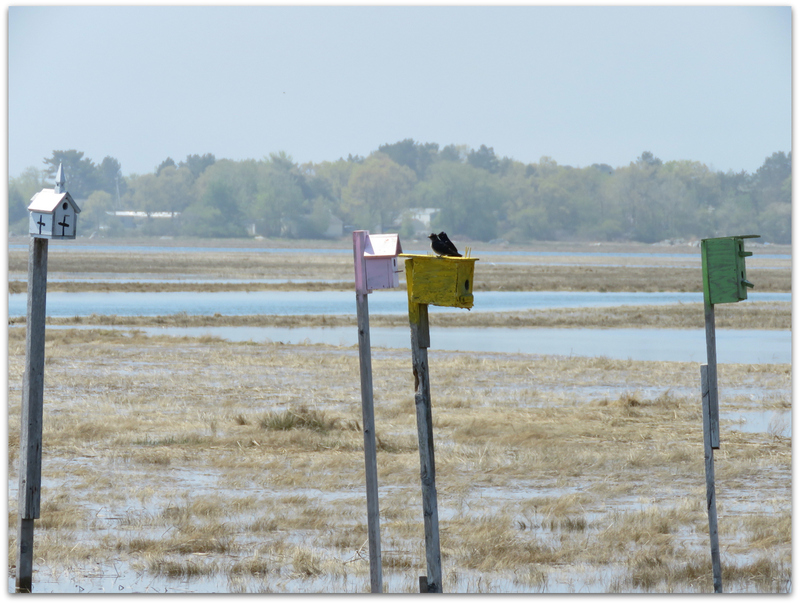 We have had a purple martin house out there for years (well, we take it down in the winter) and no purple martin has ever been seen by us within the bounds of our 14 acres. 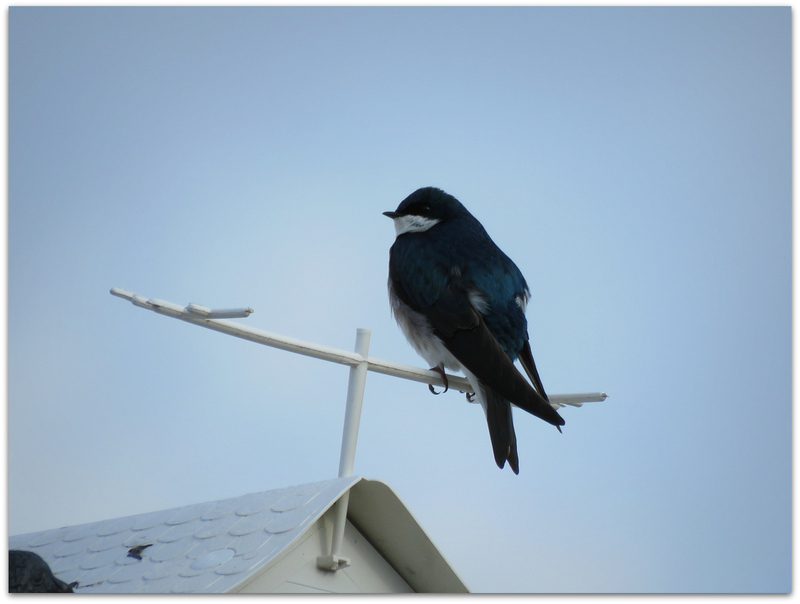 Anyway we have grown quite accustomed to our charming tree swallows. They don’t care if we stand there and stare up at them. I guess they know how fast they can fly. The antenna perches are precious, aren’t they. 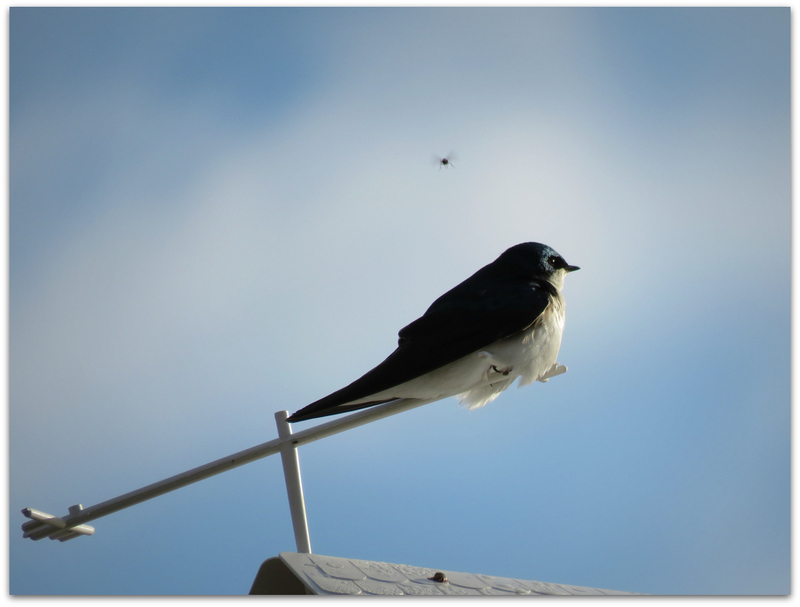 The only negative thing about the situation is that tree swallows don’t nest colonially. So the other 7 rooms in the martin apartment house are unoccupied. Except sometimes there are wasps by the end of the season. 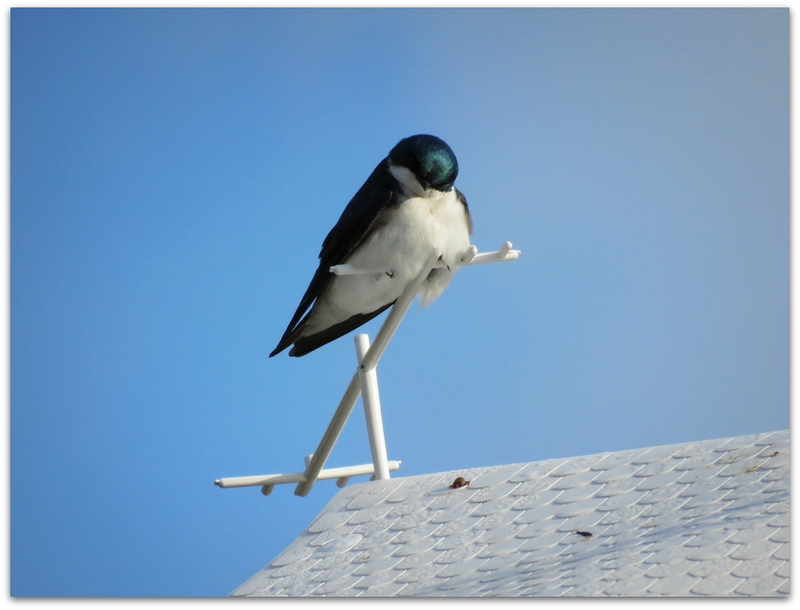 Tree swallows eat a lot of insects… but not when they are mellowing out on the roof, watching the sunrise. 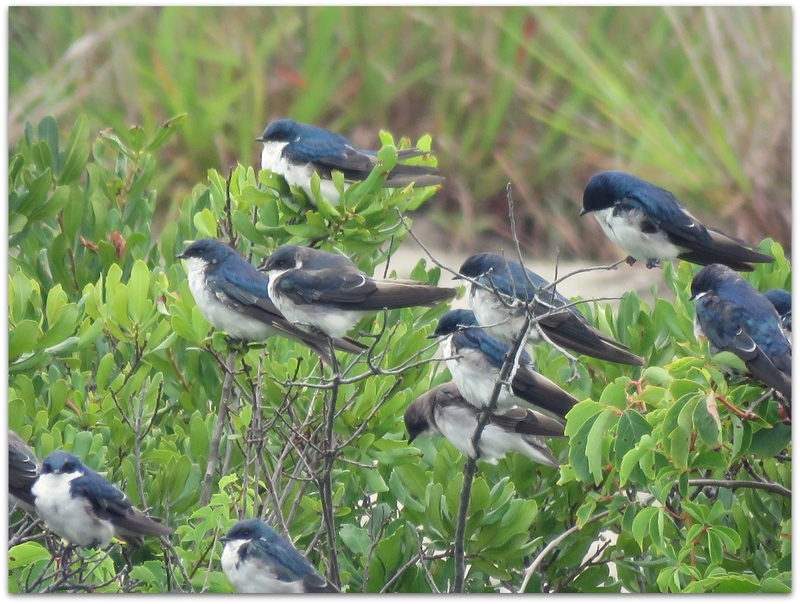 This entry was posted in Uncategorized and tagged Tree Swallows on April 21, 2015 by Amy. 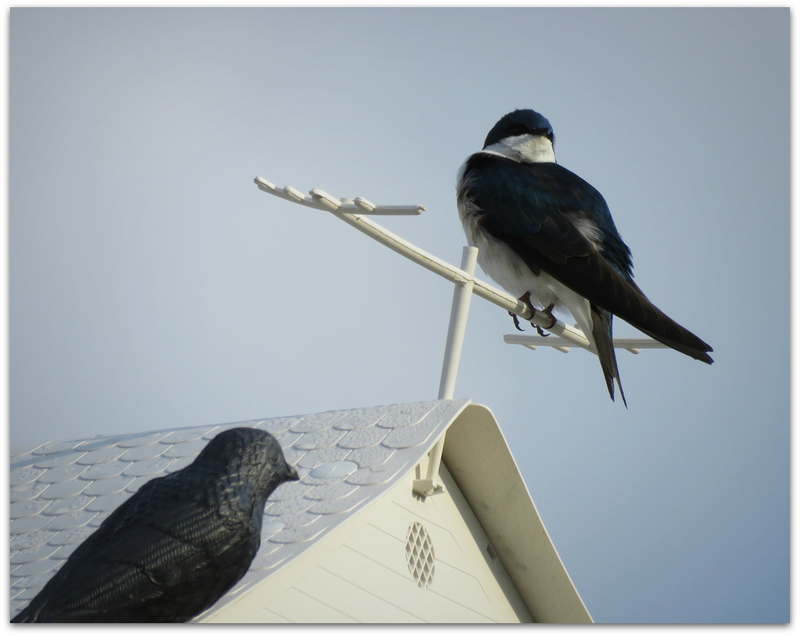 Tree Swallow perches companionably with a Purple Martin decoy. 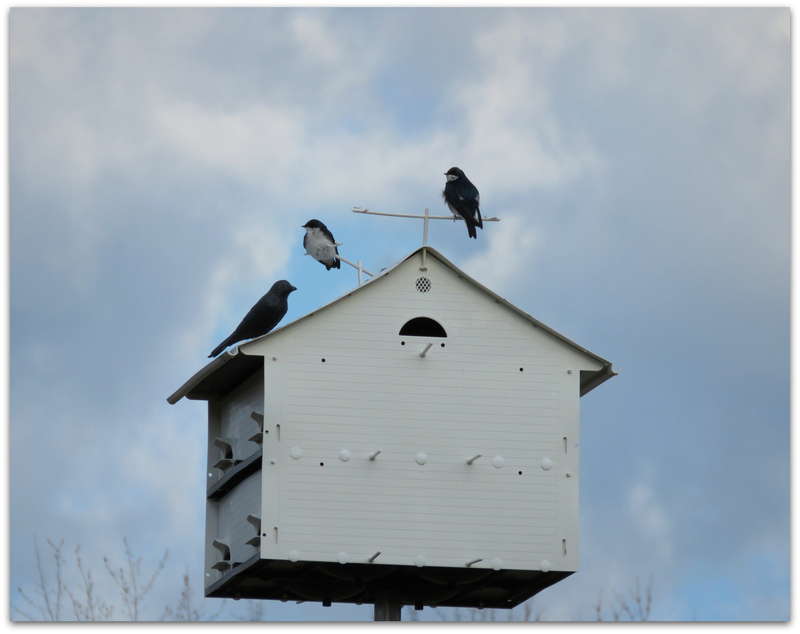 We bought our “Purple Martin House” from S & K Manufacturing. 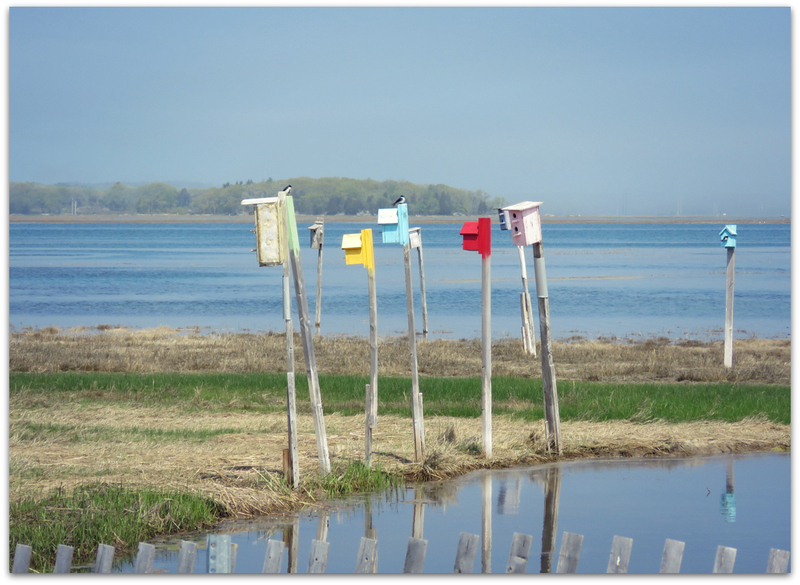 Attractive and well-built, and probably perfect for Purple Martins. Too bad the Tree Swallows get there first every spring. 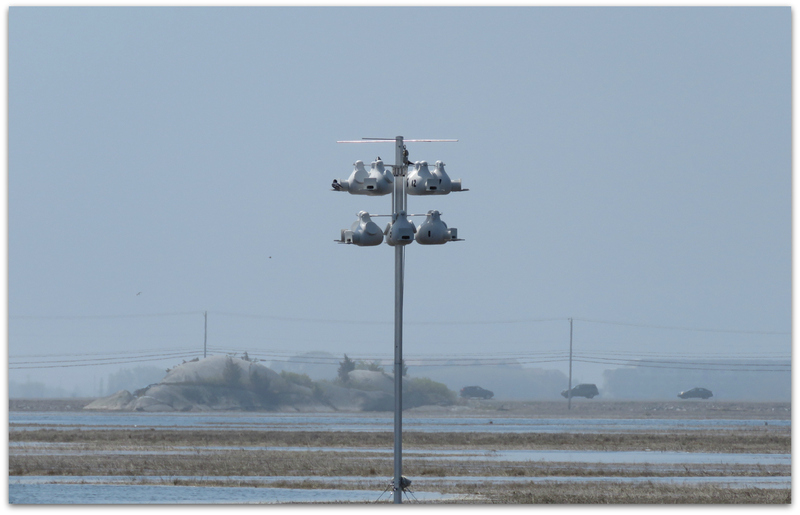 They are beautiful birds and not spooked when I just stand there and stare at them. They swoop down near me and the dog when we walk across the field, but not like they are trying to chase us away – more for fun, I think. 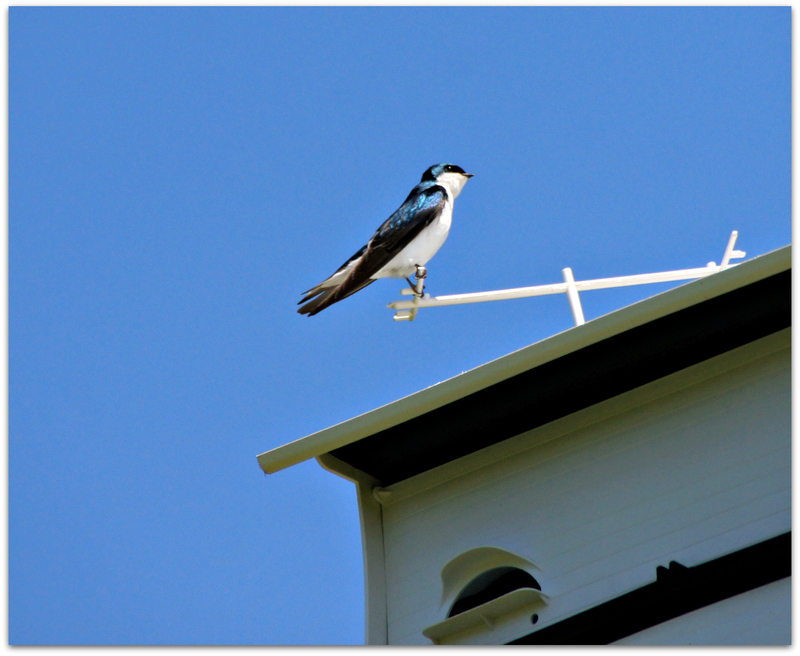 Handsome aerialists with deep-blue iridescent backs and clean white fronts, Tree Swallows are a familiar sight in summer fields and wetlands across northern North America. They chase after flying insects with acrobatic twists and turns, their steely blue-green feathers flashing in the sunlight. 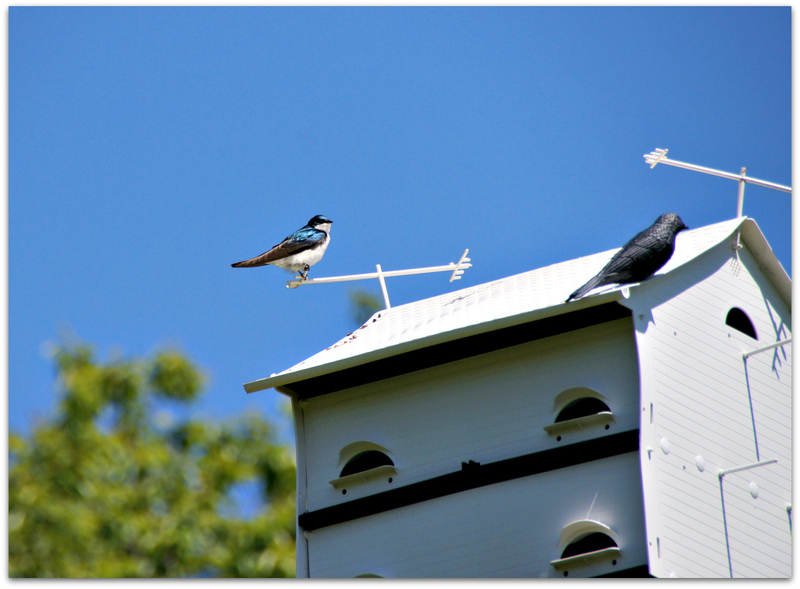 Only drawback: Tree Swallows do not share the empty rooms in their spacious aerial apartment building with martins. 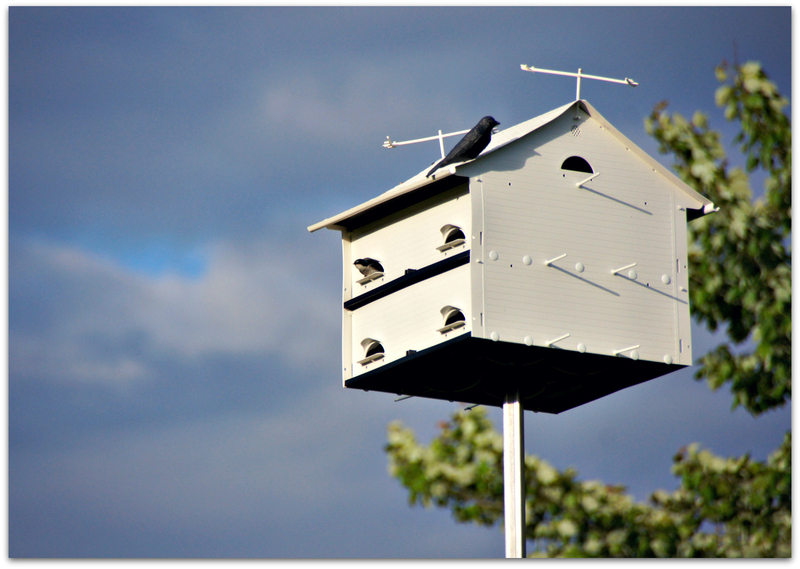 And martins nest only in manmade housing now. 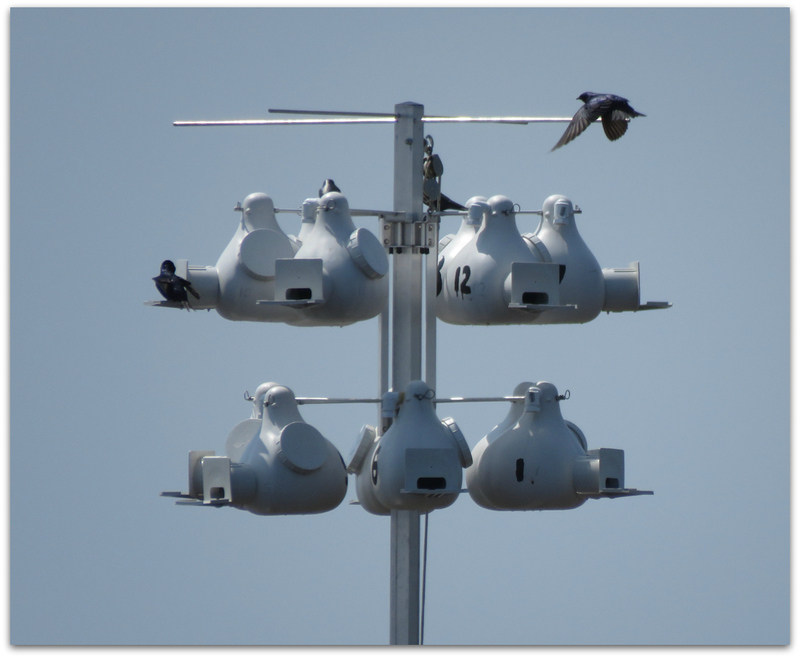 … if a pair of bluebirds or Tree Swallows has begun nesting in one compartment of a new or unestablished martin site they will try to defend the entire housing complex against other birds, which discourages Purple Martin “scouts” from settling at the new locale. 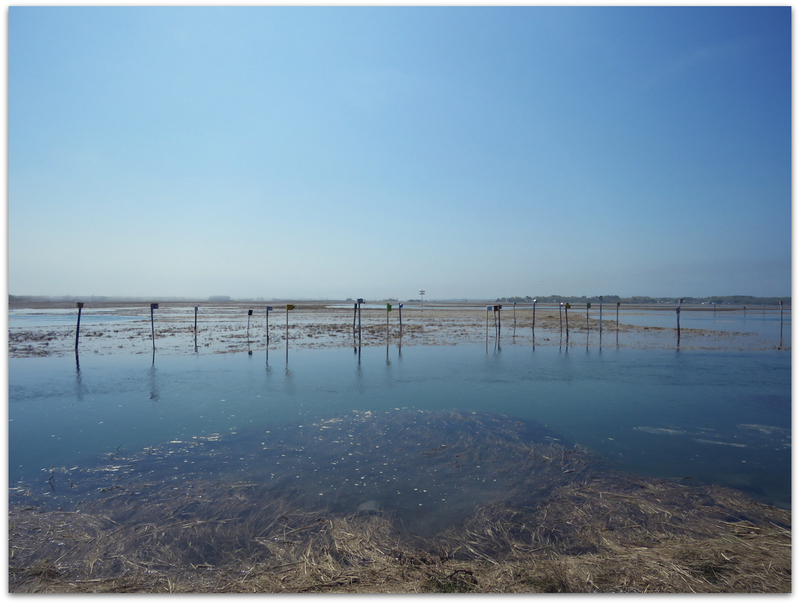 There are ways to handle this, involving a level of early to mid-spring observation and nest box guardianship that we have never been able to manage. 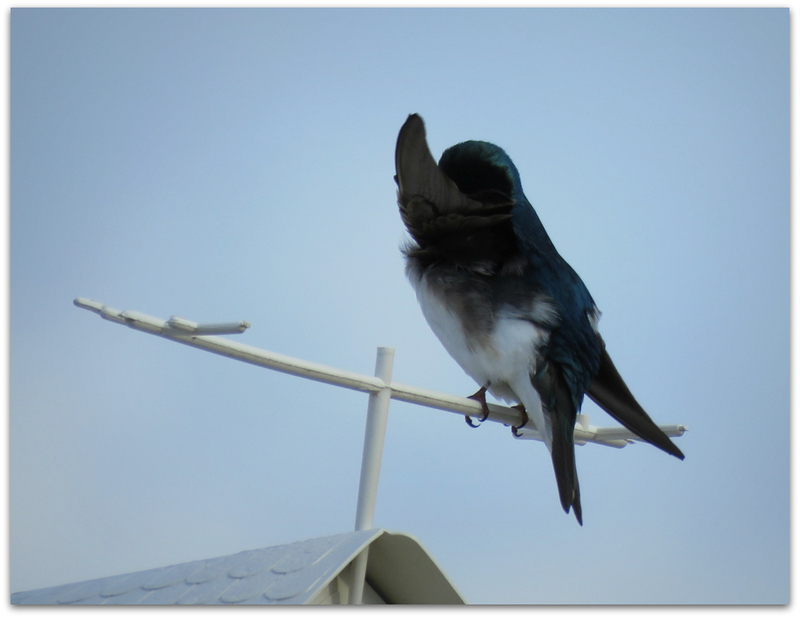 So we live with Tree Swallows. They are pretty, inspiring to watch, and they eat a lot of bugs. 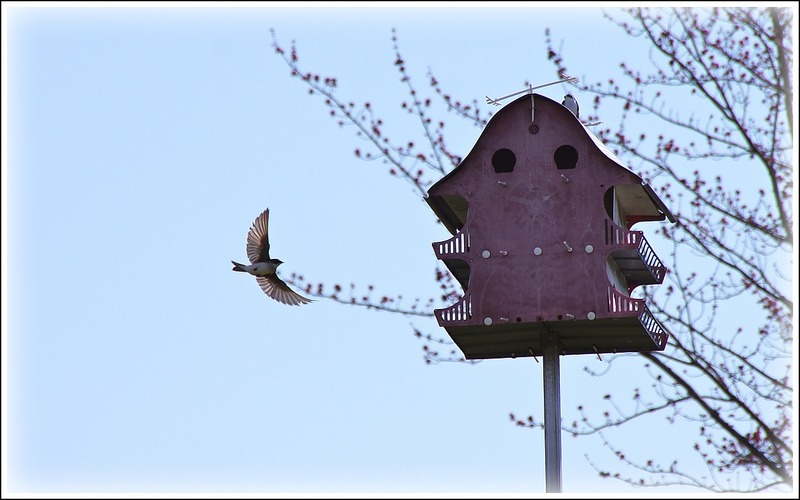 Here is a photo from April three years ago – different martin house, same location in our back field, maybe the same Tree Swallows or relatives. What bird would you be if you could be a bird for a day? Tree Swallows are near the top of my list because of their fantastic flying skills. 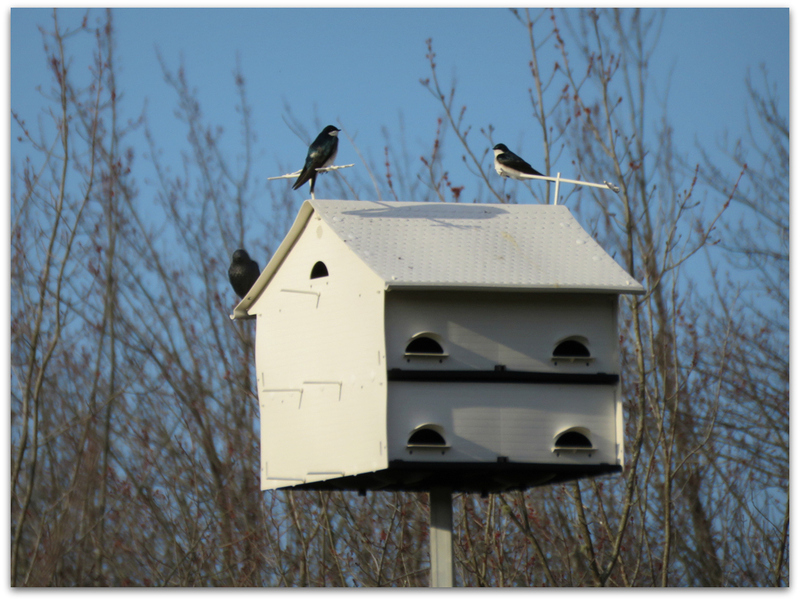 This entry was posted in Uncategorized and tagged birds, purple martin house, Tree Swallows on June 13, 2014 by Amy.